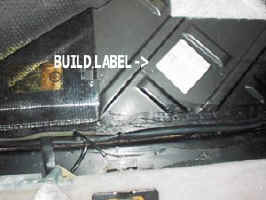 Option Code Numbers can be found on the build label under the rear cargo carpet/foam, or in your "Warranty and Maintenance Booklet" (if dealer applied it there). 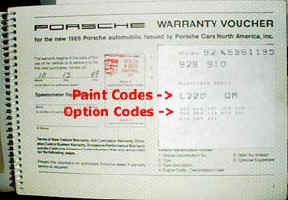 You can also get this info directly from Porsche, click on this shortcut "Kardex info" for details. M187 Headlamps with Sealed Beam Insert "Asymmetric"
M462 928 - Special Model 82 "WEISSACH" - Hellbronze Metallic w/Leather Medium Brown Int. M496 Prepared for PHILLIPS Telephone "C-Network"
M612 Prepared for PHILLIPS Telephone "C2-Network"
M611 Preparation of Telephone Installation, Nokia "D-Network"
M614 Preparation of Telephone Installation, Motorola "D-Network"
M692 CD-Changer "Porsche CD C-1"
Porsche "Kardex Info", a "Birth Certificate" for your 928. This Certificate from Porsche will typically include all of the original "as built" Engine/Transmission numbers, options and Paint/Interior info concerning your 928. You can either e-mail to place an order, call the number below OR fax this COA Order Form (requires Adobe Reader). Please feel free to copy*, download* and use the Fuse/Relay Charts and Technical Info located on our "928 Fuse/Relay Charts and Technical Info" pages . They were created to aid you in your repair and trouble shooting projects and are provided as a added service from us for you and your 928 ! *Note: Copying and/or downloading the pages on this website is allowed for personal use only, no commercial copying or downloading is permitted without prior approval from 928 Specialists.